Many people turn to topical face washes, creams and serums to address their acne. While topical treatments can be formulated to cleanse, moisturize, and/or absorb oil, these products only target the symptoms of acne and not the source of the problem. Acne is a condition caused mostly by a hormonal imbalance, specifically an abundance of androgens (testosterone), which results in an excess production of sebum, an oily substance which clogs pores. At the base of each hair follicle is the sebaceous gland where sebum is produced. Sebaceous glands are most numerous on the face, back, neck and scalp. Consequently, these are the most common sites of acne. Why topicals only "scratch the surface". Under normal circumstances, sebum travels along the hair follicle to the surface of the skin. With acne, the normal transport of sebum out of the follicle is impeded, leading to an accumulation of the oily substance, which provides an enriched breeding ground for bacteria. Cleansing the skin with soap does not remove the bacteria entrapped at the base of the hair follicle. What is seen on the surface of your skin is not indicative of what is happening under the skin's surface and a pimple formation may take up to 14 days. Topical agents only target existing acne and they do NOT affect the sebaceous glands. They do nothing to prevent acne from forming. Additionally, many acne-fighting cleansers rely on salicylic acid or benzoyl peroxide, both harsh chemicals that can lead to premature aging, irritation, redness, and dry skin, which can trigger greater oil production. Benzoyl peroxide has been associated with an increased risk of skin cancer and in 1995 its FDA status was changed from “safe” to “uncertain.” It’s always best to have a healthy skincare regimen and pairing a gentle solution with a natural and effective treatment like AcnEase® will give you the best chance at achieving lasting results. "I’m afraid of possible side effects." Despite the internal source of acne, many people balk at the idea of taking a pill to treat their problem. 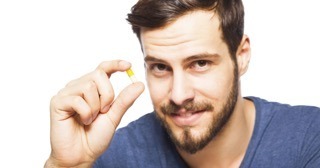 With dangerous side effects associated with prescription medications such as Accutane, it’s no surprise that many people think twice before swallowing a pill. Smart consumers are also aware that many ethical drugs aren’t safe to take if you’re pregnant or currently taking other prescription medications. On the opposite side of the spectrum, AcnEase® is completely safe to take during any of life’s changes since it’s an all botanical ingredient-based formula, containing no harsh chemicals and no side effects. NONE of the herbs included in AcnEase® are listed by the FDA or European and Japanese authorities as dangerous or unsafe. The ingredients present in AcnEase® have been tested extensively, most are even qualified as foods and have been found to be non-toxic, and safe for consumption. It can be used by anyone, teens or adults, males or females, or pregnant or nursing mothers, regardless of the acne or complexion type (from the very light to dark). Also, AcnEase® does not have sun exposure restrictions. "How do I really know what those ingredients are?" It can be disconcerting to look at the back of a bottle, only to find a list of ingredients you can’t even pronounce. AcnEase® is an all-natural, herbal acne treatment that stops acne before it starts by counteracting the effects of hormonal imbalance and the overproduction of sebum. All herbs used in the making of AcnEase® are of the highest quality and have been extensively tested and proven safe in clinical trials. Here’s a look at what can be found in each dose of AcnEase®. Gardenia Fruit is known for its cleansing and anti-inflammatory properties and is an important ingredient present in AcnEase® that reduces inflammation and eliminates toxins. Hottuyniae's primary usefulness is to address infections by relieving toxins and promoting the drainage of pus. Scierotium is a medicinal mushroom that assists digestion and improves metabolism. This ingredient works synergistically with the ingredients in AcnEase® to further reduce acne symptoms. Dandelion possesses an anti-inflammatory action and decreases the size of abscesses. As well as aiding with the stomach and liver functions, it reduces swelling and sores. Balsam Pear is rich in potassium, Vitamin A, Vitamin C and many antioxidants. It also helps manage sugar and carbohydrates, which is important for healthy skin. Paired with the Mustard Leaf, it has a cleansing and analgesic effect. Mustard Leaf is rich in calcium and iron and helps to restore bacterial balance in the intestines. Rich in vitamin A, iron, and zinc, these greens have been used throughout the world to relieve pain, and as a diuretic and an antibiotic. "I’m a vegetarian, and don’t consume animal derived gelatin." 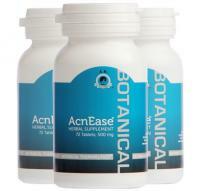 AcnEase® is vegan friendly, 100% plant-based, and free of any animal bi-products or derivatives. "I don’t like swallowing pills. Can I crush them?" Certain pills lose effectiveness when this is done. However, with AcnEase®, efficiency is not lost if you crush them due to the high quality ingredients. There are many users who don’t like taking pills, so we tell them to try to take them with foods that are thick (such as yogurt, smoothies, applesauce, cottage cheese, etc.) so that you won’t feel them going down. If that doesn’t work, you can crush the tablets into a drink or something thicker – again, it won't take away from the effectiveness but the taste will be slightly bitter because of the herbal ingredients. "Systemic treatments are too expensive." Safety is our primary concern and the high quality of ingredients used in AcnEase® come with a higher price than many topical treatments you might find in a drugstore. With a 96% proven success rate, the term “you get what you pay for” rings true. We want to hear from you! Are you hesitant to try a systemic acne solution, and if so, why? For those of you who have overcome your fears and concerns, what has the experience been like for you? Tell us in the comments below!